Now I know our grandmas would like to see us go buy all the raw ingredients, and make it from scratch. 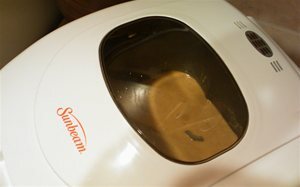 But this is 2009. making a loaf of awesome pumpkin bread to go with your coffee is as simple as buying a bread maker, and then buying the quick bread mix from your grocery store. I bought the Kroger Brand Pumpkin quick bread and muffin mix. In all to make the bread you need the following. 2 - 4 Eggs ( 2 is by the directions, 4 is to increase the protein content ), I use 4 Eggs. Add all your liquid ingredients to the pan, then pour the bread mix on top. Plug in your bread maker and set it to the quick bread option, I also used the medium crust setting. 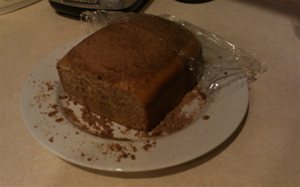 The Economics of Making your own Pumpkin Bread. This cost could be lower if you were to use White eggs instead of brown, also just use 2 eggs instead of 4 like I did. Also in my first loaf I forgot to add the oil and the bread turned out just fine, so if you wanted you could just not use oil. Just make sure you have a stick free pan else getting your bread out of the pan may be difficult. 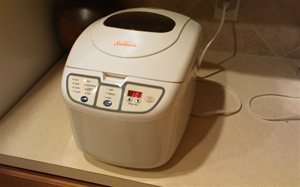 Of course the Electricity the bread maker uses isn't free. 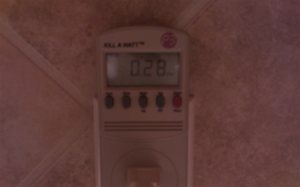 So I hooked up my kill-a-watt meter to it while it cooked my bread. .28 KWH from the time I turned on the bread maker to the time it beeped and was done. $0.036 Cost of electricity used. Total cost of making bread. So you could buy a slice of pumpkin loaf from starbucks, or you cold make an entire loaf for about the same cost. 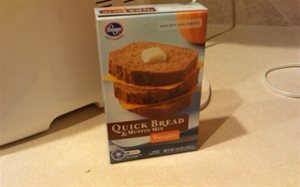 I highly recommend anyone with a bread maker to try to Kroger Quick Bread mixes. They are cheap and taste great. One thing I found was the Pumpkin Loaf has a high demand, and is often out of stock. So if you see some, buy a few as they might not be there the next time.